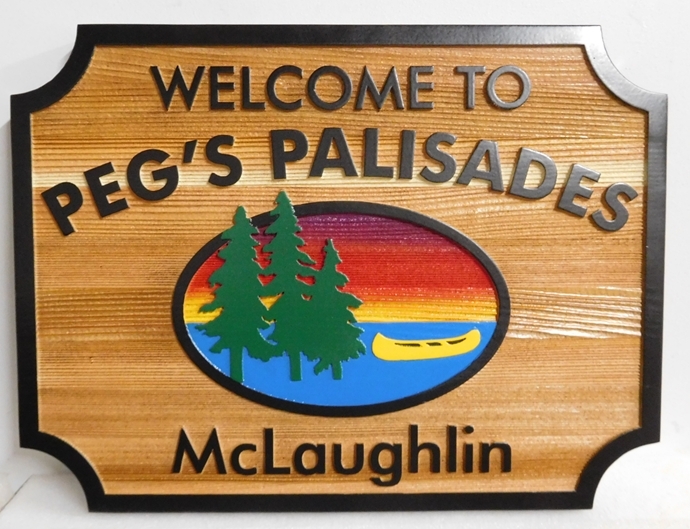 M22378 - Western Red Cedar Lake House Name Sign "Peg's Palisades"
This interesting and picturesque Western Red Cedar lake cabin name sign "Peg's Palisades" has been carved in 2.5-D flat relief. The text, borders and trees are elevated above the background and lake and sky. The scene is hand-painted with an artist brush and airbrush. The sign is clear-coated twice for additional protection from the UV and rain and snow. This sign can be mounted on a door, an adjacent wall, a gate, on a metal or wood post, or hung from a wood or iron hanger.